2017, anti-Islamic, anti-islamism, EU, Europe, European Islamophobia, European Islamophobia Report, European Islamophobia Report 2017, european union, Islamophobia, Islamophobia in Europe, Islamophobia PDF, Islamophobic, PDF, Presentation of the European Islamophobia Report, What is Islamophobia? Succeeding the reports of 2015 and 2016, SETA has published the European Islamophobia Report 2017 (EIR), which provides country-specific surveys on the development of Islamophobic attacks in 33 European countries. Widely ignored and misunderstood, Islamophobia constitutes a serious threat for European democracies, undermining the life of millions of Muslim citizens, weakening domestic security, strengthening the rise of xenophobic groups and damaging the image of tolerance within the EU worldwide. In 2017, around 908 attacks targeted Muslims in Germany, 664 in Poland, 364 in Netherlands, 256 in Austria, 121 in France, 56 in Denmark, and 36 in Belgium. These figures are estimated to be higher as most attacks are usually not reported and thus do not appear in statistics provided. This unacceptable escalation of violence is also a matter of concern for Turkey as millions of Muslim Turks live in the old continent. 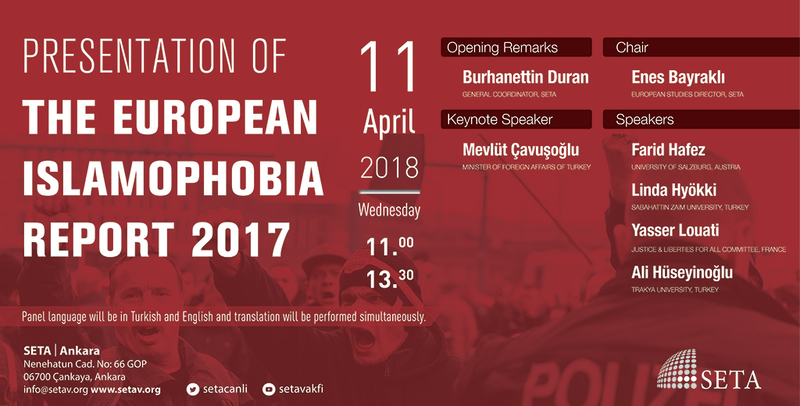 Within this framework, the SETA European Research Directorate will organize a panel that will discuss the main findings of the European Islamophobia Report 2017. What are the current dynamics of Islamophobia in Europe compared to 2015 and 2016? How do European countries deal with this phenomenon? What are the best practices to counter Islamophobia? What policy recommendations does SETA propose? All of these issues and many other questions will be discussed in this panel. Opening remarks for the panel will be made by Burhanettin Duran, General Coordinator of the SETA Foundation. We are also honored to host H. E. Mr. Mevlüt Çavuşoğlu, Minister of Foreign Affairs of Turkey, as keynote speaker to this important panel. In the panel moderated by Enes Bayraklı, SETA European Research Director, the first speakers is Farid Hafez, researcher at the Department of Sociology and Political Science at the University of Salzburg. In his presentation he will provide information on main findings of this years’ European Islamophobia Report. The second speaker is Linda Hyökki, researcher at Sabahattin Zaim Universtiy and she will evaluate the Islamophobia in Finland. Yasser Louati is the third speaker of the panel. Louati is the head of the Justice and Liberties for all Committee and he will talk about Islamophobia in France. Lastly, Ali Hüseyinoğlu, researcher at Trakya University, will focus on the Islamophobia in Greece. We would be honored to host you at the event. Notice: Panel language will be in Turkish and English and translation will be performed simultaneously.